Thursday is GURPSDay. We’re a week and about 69,000 into the GURPS Dungeon Fantasy Kickstarter . Below you can find the blog activity from the last seven days. Over the last week there have been 53 GURPS-related posts from our list of 63 blogs that have popped up on the radar screen today. In the first week of the kickstarter, we’re hitting a pace of just shy of $90 per pledge. SJG has found a way to guarantee European shipping at $30 per order (or thereabouts – go read +Phil Reed‘s precise wording for details), and so with 22 days to go, we need perhaps 10-15 backers per day to get where we’re going. 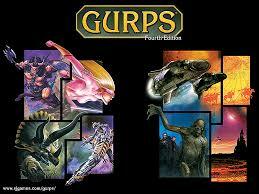 Don’t make them wait – the higher the funding of this project, the more they’re convinced GURPS has life in it. We also saw the release of Dungeon Fantasy 19: Incantation Magic, by +Christopher R. Rice and +Antoni Ten Monrós. It’s the long-awaited (by them, and if you’re into Vancian-flavored magic, by many more) book introducing an alternate magic system to Dungeon Fantasy. It’s based on Ritual Path Magic, but nearly every jot and tiddle was either worked over or looked over to ensure it plays fast and simple, like the rest of the DF line. Sundered Lands 12.1 (9/08/16) – Seeker and Moonscar head off to take care of some business of their own. They revisit the Harbormaster’s estate, talk with an enemy and run into some prejudice. The newest adventures in the Sundered Lands of Palladium, our GURPS: Palladium Fantasy campaign. Sundered Lands 12 (9/08/16) – The companions regroup after their adventures in the Vanderboren Vault and plan their next moves, including gathering some information on Lavina’s brother, Vanthus, do a little magical shopping and prep Arn for some undercover work. The newest adventures in the Sundered Lands of Palladium, our GURPS: Palladium Fantasy campaign. Dungeon Fantasy Boxed Set: The Word of Kromm (9/07/16) – With all the excitement about he DF Boxed Set, and even with my interview, there’s a lot of information Sean Punch has put out there in the DF threat of the SJG Forums. I’ve collected it here into one post. Dungeon Fantasy Boxed Set: Interview with Line Editor Sean Punch (9/07/16) – I had the opportunity to sit down once again with GURPS Line Editor Sean Punch for a 90-minute interview concerning the GURPS Dungeon Fantasy Boxed Set. Aeon Campaign S3E8 – Take Me Out to the Ballgame (9/06/16) – Aeon S3E8 – We take on a giant mob in Yankee Stadium. Lots of mooks, a giant minigun, and a guy with six attacks who can deliver a -8 deceptive attack. It’s a pretty robust battle and we blunder through thanks to huge karma spends. Nonetheless, Zephyr almost bites it. We win, but it’s messy. DF Kickstarter Funding Goals and Costs (9/03/16) – Is $100K too much for a KS goal for the DF boxed set? No. Definitely not, and I give estimates of why I think it’s either bang-on or even a little low. Applies to any self-publishing venture. Why GURPS Dungeon Fantasy Is Awesome (9/07/16) – In light of the Dungeon Fantasy Kickstarter, this post discusses why dungeon fantasy is so popular—and why GURPS Dungeon Fantasy is a great way to play the genre. Sorcery: Landscaping Spells (9/08/16) – A bunch of simple spells with a farming application theme. Review: #3/72 – Alternate Dungeons (9/08/16) – One of my favorite issues, it adds a lot to Dungeon Fantasy! Review: Pyramid #3/44 – Alternate GURPS II (9/06/16) – Lots of options for tuning depth and complexity. Ritual Path Magic: Cheat Sheet (9/05/16) – A cheat sheet with lots of tables from the Ritual Path Magic System. Review: Power-Ups 1 – Imbuements (9/04/16) – A good supernatural ability system for combat oriented characters and campaigns. Review: GURPS Fantasy (9/03/16) – A book that feels mostly superceded nowadays, but with a few treasures here and there. Ritual Path Magic: Necromancer Spells (9/02/16) – Just a handful of warm-up low level RPM spells. Two Important GMing Lessons (9/07/16) – Two things I (re)learned GMing at last weekend’s convention – The Players Want To Have Fun, and Let Her Be A Werewolf! Power Armor, Powered Up! (9/08/16) -Need some more heavy metal love in your life? The bog standard Dreadnought Heavy Battlesuit not cutting it anymore? Need some custom powered suits for hapless soldiers as they battle the evil space bugs? Then you needs some Power Armor, Powered-Up!.